L. coxalis specimen, Berlin Museum. Physical description: Large in size with noticeably tapered membrane. Dorsal side mostly red except for black scutellum, clavus, and membrane. 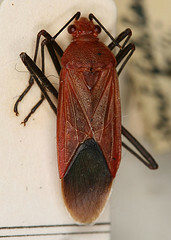 Pronotum is relatively broad posteriorly. Ventrum is black except for costal margins and coxae. Appendages are black. Currently, we cannot infer a range for this species because we do not know what host plant it uses and have no recorded collection points. Kirby, W.F. (1891): Catalogue of the described Hemiptera Heteroptera of Ceylon, based on the collection formed (chiefly at Pundaloya) by Mr. Ernest Green. J. Linn. Soc. Lond. Zool., 24, 72-176.